FILE - A journalist takes a picture of China's mobile company Xiaomi's new model Mi Max at its launching ceremony in Beijing, May 10, 2016. Chinese smartphone maker Xiaomi has purchased 1,500 patents from Microsoft, as part of an effort by Chinese companies to acquire intellectual property rights in preparation for expansion into overseas markets. In exchange Microsoft-owned software will be bundled on Xiaomi phones. Ningling Wang, a partner in Shanghai with the law firm Finnegan, Henderson, Farabow, Garrett & Dunner, said the Xiaomi Microsoft deal may indicate that Xiaomi intends to sell phones to American consumers. “I think they are doing what a U.S. patent attorney would like to see. They are strengthening their portfolio and preparing a business case for long term entering the U.S. market. So I think it’s possible they are going into the U.S. market pretty soon,” Wang said. Xiaomi sales soared in 2014, when the smartphone manufacturer drew Chinese consumers by offering premium phones at a low price through an online sales strategy. 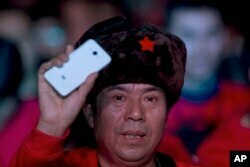 Since then Xiaomi’s revenue has declined as China’s domestic smartphone market became saturated. China's Xiaomi Redmi 2 smartphones are displayed to the media during their launch in Sao Paulo, Brazil, June 30, 2015. Through its arrangement with Microsoft, Xiaomi will now bundle Microsoft software, including Word, Excel, Powerpoint, Outlook and Skype on its phones. The company says the deal has expanded its patent portfolio to include video, wireless communication and cloud computing technologies. Xiaomi’s purchase of 1,500 patents from Microsoft is a fraction of the 60,000 patents Microsoft currently owns, but through this deal Xiaomi has eliminated a potentially litigious rival should it enter the U.S. market. Matthew Laight, head of the intellectual-property group in Asia Pacific for the law firm Bird & Bird, said many Chinese companies are purchasing patents to further their expansion goals abroad. The acquired patents also allow Chinese companies to increasingly go on the offensive rather than defensive in cases involving intellectual property rights. Beijing authorities have recently ruled that some Apple devices violate the design patents of Chinese smartphone maker Shenzhen Baili. Last week the Beijing city government ordered a halt to sales of the iPhone 6 and iPhone 6s because of the patent case, which Apple is appealing. China’s State Intellectual Property Office recently revoked both patents owned by both Jaguar Land Rover and Jiangling Motors Co., after Jaguar Land Rover had filed a lawsuit against Jiangling Motors, claiming that it copied a car design. In May, Huawei filed a lawsuit in a U.S. court against Samsung, saying that it infringed on as many as 11 patents related to 46 devices. Haifeng Huang, a partner with Jones Day in Hong Kong, said the purchase of patents allows Chinese companies greater leverage to target and compete with rivals, through transforming them into business partners and incorporating their technologies into their own products. “Chinese companies, they are in the process of doing more and more R & D. In the meantime they want to catch up with technologies developed by other companies, and they want to incorporate those technologies into their own products. So by purchasing those patents they will be able to use those patents and incorporate those technologies in their own products,” Huang said. Xiaomi phones sold 71 million smartphones in 2015 in Greater China, Singapore, Malaysia, the Philippines, India, Indonesia and Brazil. A year ago Xiaomi was ranked number one in market share in China and third in global market share. 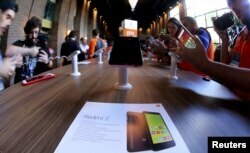 Its sales have slipped since then, and the company has fallen outside the top five global smartphone vendors. The company says it is focused on building sales in India, before it enters the U.S. or other markets abroad.